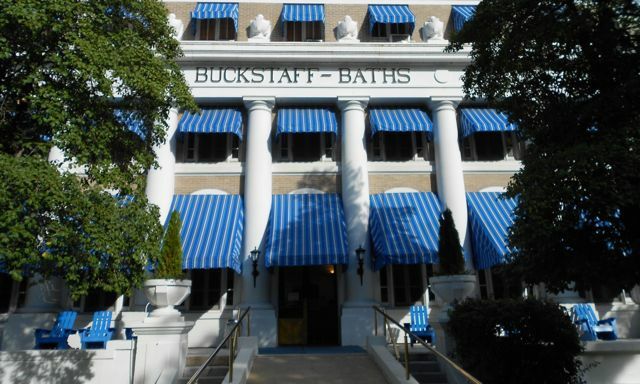 The last stop on our Arkansas tour has been the unique town of Hot Springs. 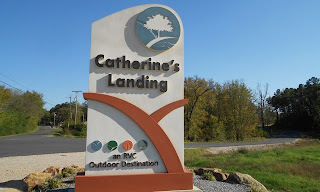 Our home for the last 12 days has been Catherine's Landing, a new and quite comfortable park on the southeastern edge of town. Catherine's Landing is the second RVC Outdoor Destination park we've stayed in. (The other is Garden of the Gods in Colorado Springs, which was recently purchased by RVC.) Everything about this park was top notch. We'll definitely be back! Our site backed up to Lake Catherine, which looks more like a creek right here. 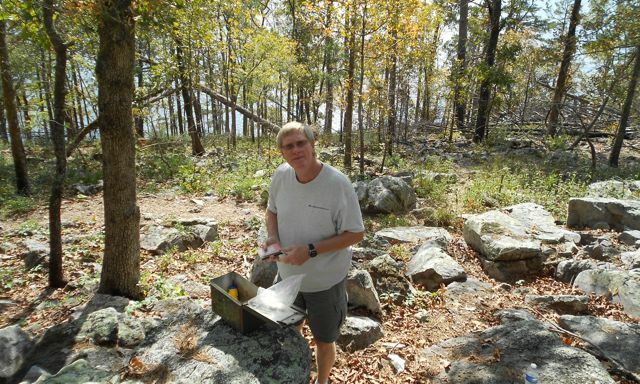 Our spot was beautiful, quiet and peaceful. 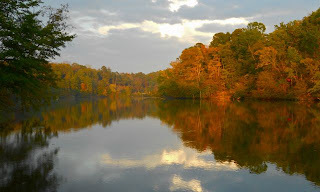 The autumn colors are just arriving at Lake Catherine. They look particularly stunning at sunset. 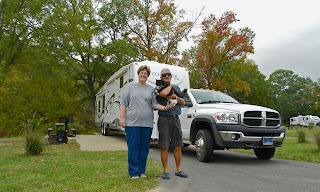 One of the highlights of our stay was meeting up with friends Cathy, Steve and Dottie. We had a great time with these three, as always. We look forward to seeing them again in Kansas City. 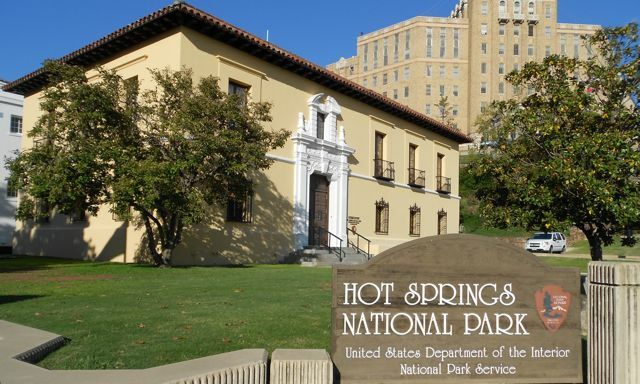 The primary reason we chose to visit Hot Springs was to check another National Park off our list. 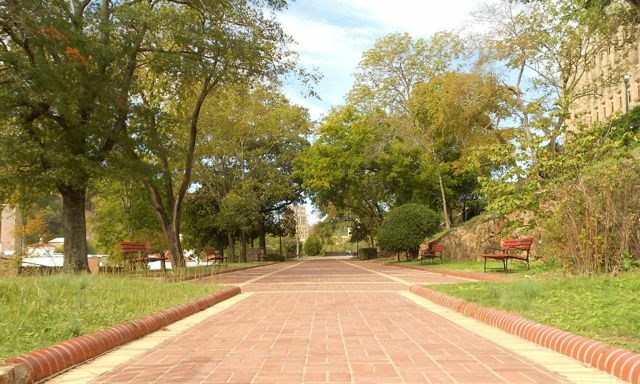 Unlike most National Parks, where you drive miles and miles to cover everything the park has to offer, Hot Springs National Park is located in the center of town. 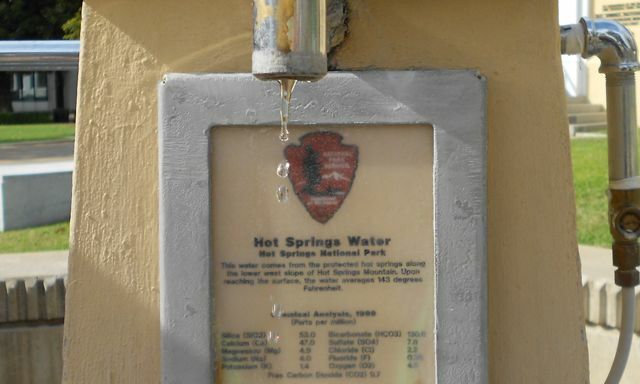 For years, the thing that brought visitors to these parts were the namesake springs. They are hot, indeed! The thermal water coming from this spigot averages a temperature of 143 degrees. It was definitely hot to touch. (Yes, of course we did!) We saw folks filling jugs from this spigot and others like it around the park. Our tour of the park was actually a stroll. 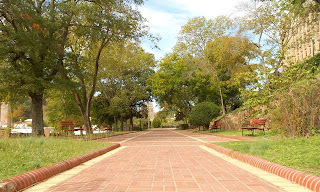 The Grand Promenade is a beautiful tree-lined walking path that sits above and behind Bathhouse Row. 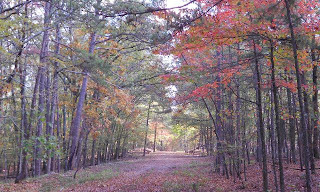 Once upon a time, the hot springs were accessible from this path. But, they have since been sealed. 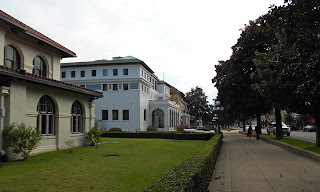 Walking along Bathhouse Row, we felt a bit like we'd stepped back into the 1920s. 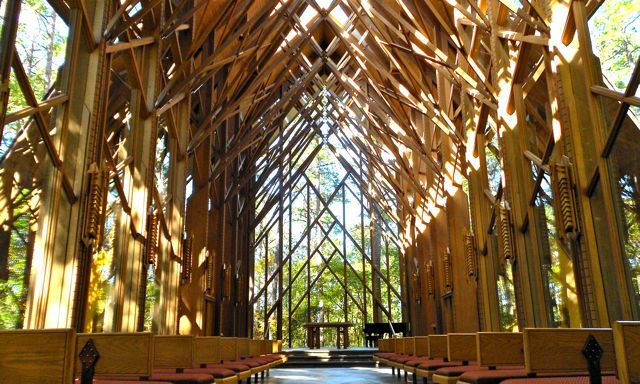 These eclectic buildings are in various states of renovation and repair. But, they reflect a bygone eara when the rich and famous came here to enjoy "America's Spa." 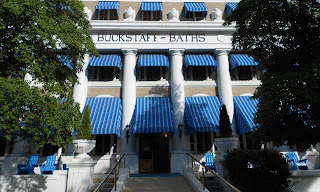 Buckstaff Bathhouse is the only facility that still offers the traditional Hot Springs bathing experience. The park Visitors Center features a video that explains how the process works. We decided we didn't need a personal assistant to scrub us down, so we opted for a less traditional way to take in the "healing" waters. We decided to enjoy the Quapaw Baths. 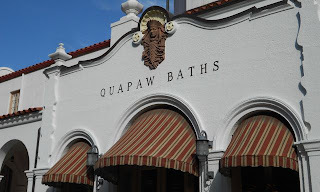 The Quapaw Bathhouse closed in 1984. 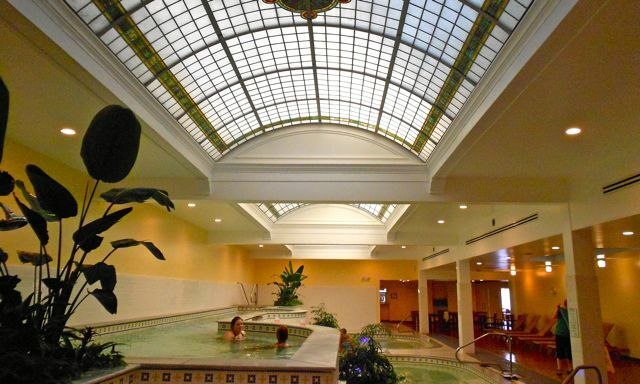 A renovation in 2007 included the creation of four "public" thermal pools, several private bathing rooms and a full service spa. We donned our swimsuits and headed for the thermal pools, which ranged from 93 degrees to 104 degrees. Upon the attendant's advice, we started with the hottest pool and worked our way down to the "cool pool". (It's amazing how cool 93 degrees can feel!) The pools featured jets and waterfalls. 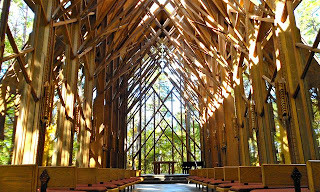 The stained glass dome cast a soothing light as soft instrumental music played in the background. A row of teak lounging chairs provided a perfect spot to cool off with a glass of icy water (It's important to stay hydrated!) between soaks. Ahhhhhhhh! This is what a couple of hours at Quapaw will do to you! While Steve was with us enjoying to pools, Cathy had a full body massage. 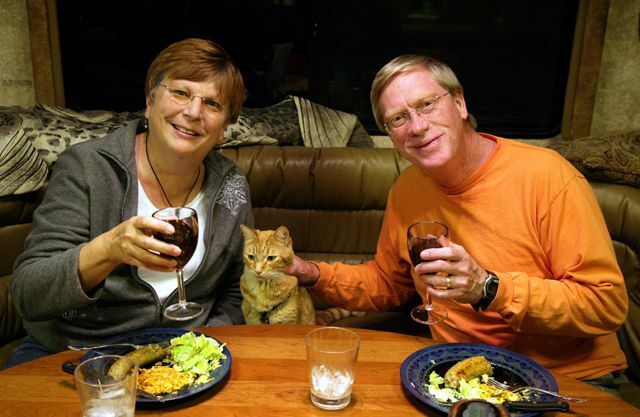 Don't they look relaxed? We all did! The Quapaw portico offered us the perfect spot to transition from the spa to the real world. 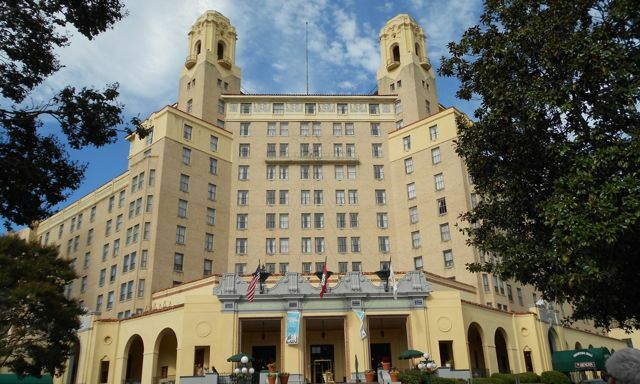 At the north end of Bathhouse Row sits the stately Arlington Hotel, a Hot Springs landmark. In the 1930s, this was reportedly a favorite hangout of Al Capone. 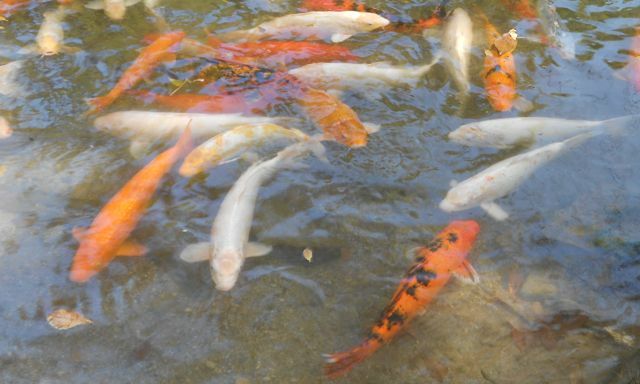 Today, it has a standout lobby bar, a highly acclaimed spa and lovely Sunday brunch buffet. 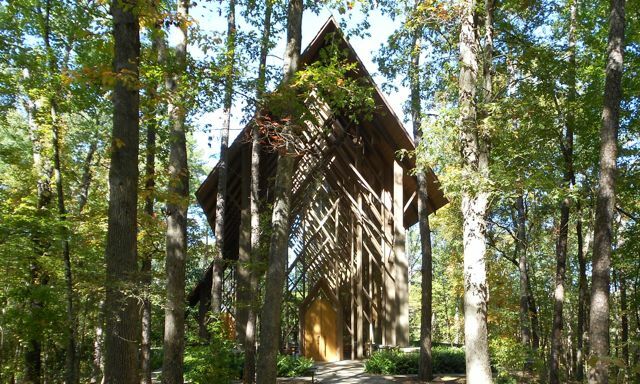 Steve and Cathy also joined us for a tour of Garvin Woodland Gardens, a 210-acre botanical garden that is part of the University of Arkansas. We had been told this was a "don't miss" when visiting Hot Springs. And, we would have to agree. 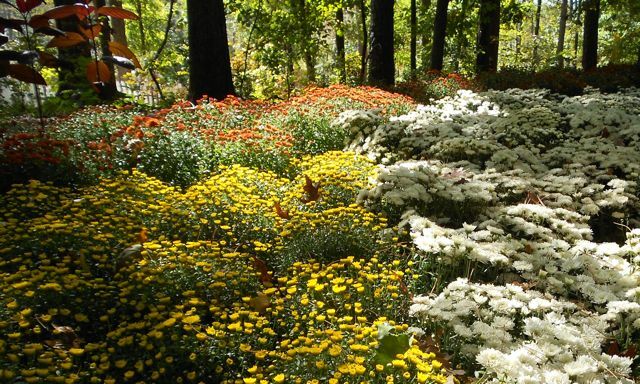 This time of year, the thriving clumps of mums are one of the few things blooming. But, there still is so much to see. 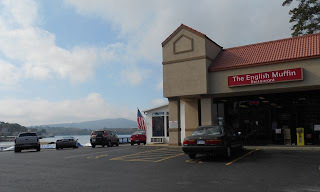 This is a place where you must have good walking shoes. 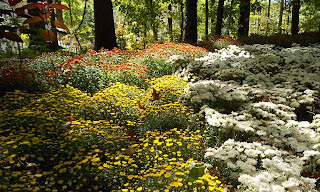 Our five-miles-plus hike took us through each of the themed gardens amongst the heavily treed forest on the shoreline of beautiful Lake Hamilton. It was a great walk! 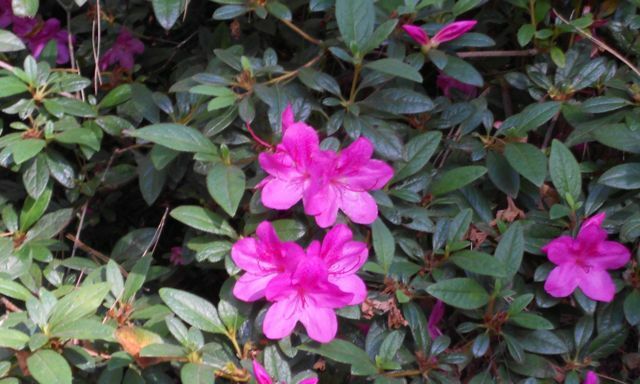 We did see a few azaleas in bloom! 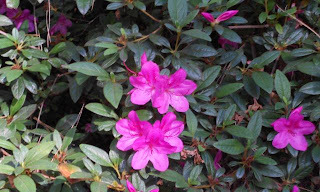 We saw hundreds of interesting "blooms" like these! Garvan staffers were busy hanging lights everywhere for the Holiday Lights spectacular. 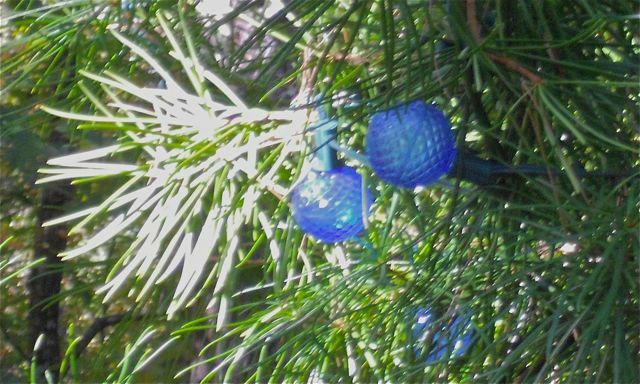 Beginning November 17th, more than two million lights will twinkle throughout the gardens. 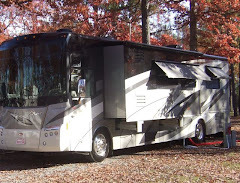 We'll have to plan a return trip during the holiday season! 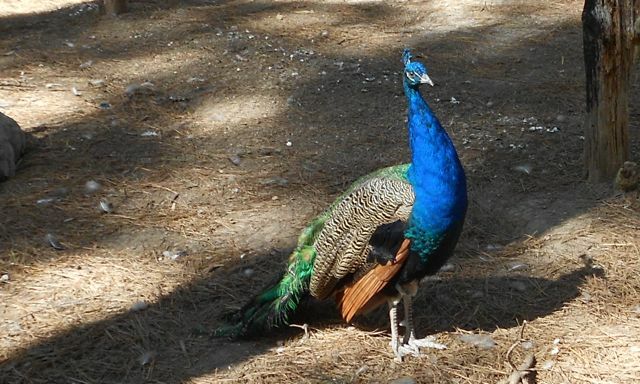 This Blue India Peafowl is one of the residents at the aviary in the nature preserve. 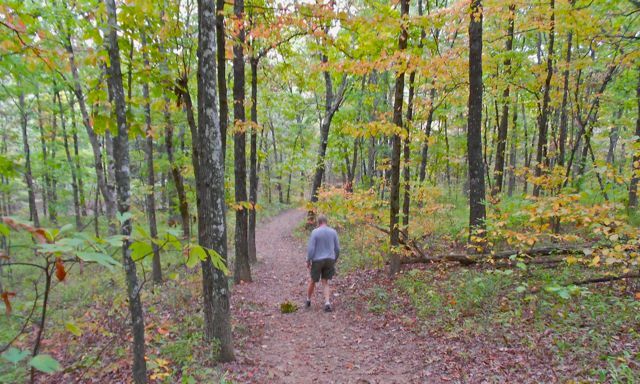 Reportedly, the local Audubon Society has spotted more than 120 species of birds in this area, which features a 1.9-mile aptly named Birdsong Trail. We didn't see or hear many birds on our hike. But, the views were lovely. Beautiful pieces of sculpture and architecture can be found throughout the gardens. We went looking for the crown jewel and nearly missed it. It's there, hiding in the trees. 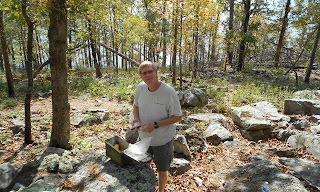 As we neared the tip of the peninsula, we hopped on the trail, picked up a geocache and made our way to the observation deck. What a view! Lake Quachita covers approximately 40,000 acres and has approximately 200 islands. No homes are allowed along its shoreline, which helps maintain its pristine beauty. It is Arkansas' largest and as one of the cleanest lakes in America. The Three Sisters Springs historical site is located in the park. 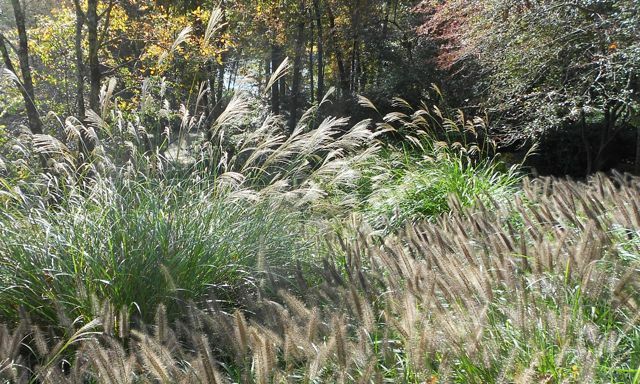 According to local history, this site was homesteaded in 1875 by John McFadden, who named the springs in honor of his three daughters. In 1907 the area was developed into a resort and bottling company. 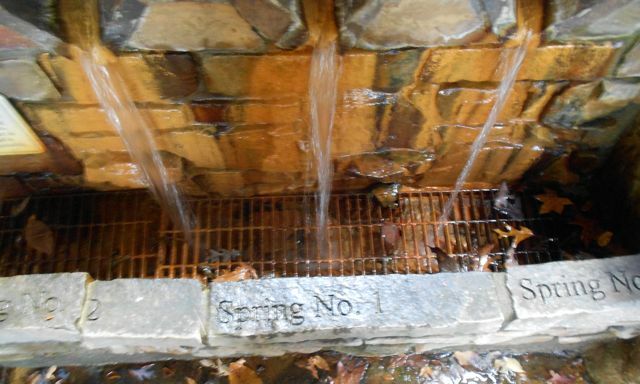 For ten cents a bottle, customers bought water from the three springs, which claimed to cure different ailments. Spring No. 2, in the center, reportedly cured "chronic constipation, chronic indigestion, catarrh of stomach, excessive acid, gastritis, ulcerated stomach, poor assimilation and elimination, low blood pressure, gall stones, mucus colitis." That's powerful water! We caught up with our friend David who recently moved to Hot Springs. (He has a very official job in town.) 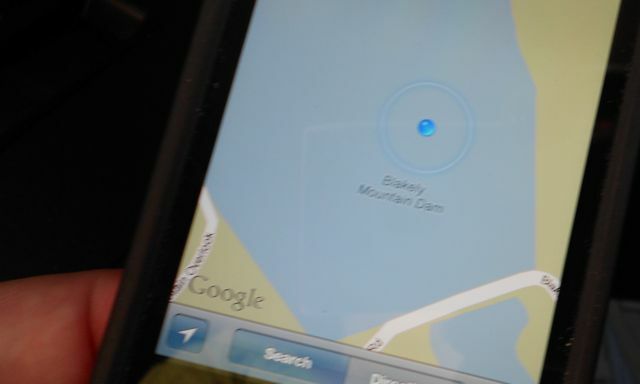 During our very enjoyable lunch, he recommended that we visit Blakely Dam. 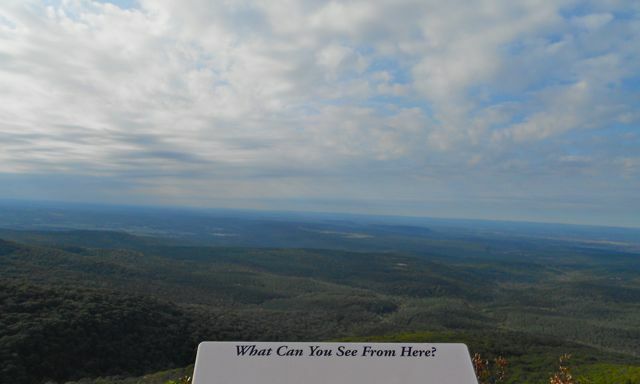 He said the view was not to be missed. 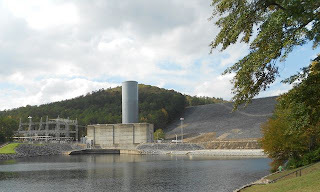 On our way back from Lake Quachita, we stopped by the dam. While the dam was impressive, the view was not. 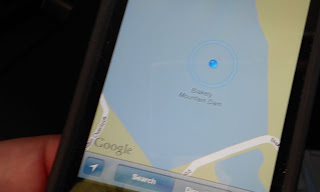 According to Google maps, we had reached the end of the road. But, in search of the not-to-be-missed view, we kept driving. It looked like Rocky was in the water. But, we were high and dry. This is the view Dave was talking about! 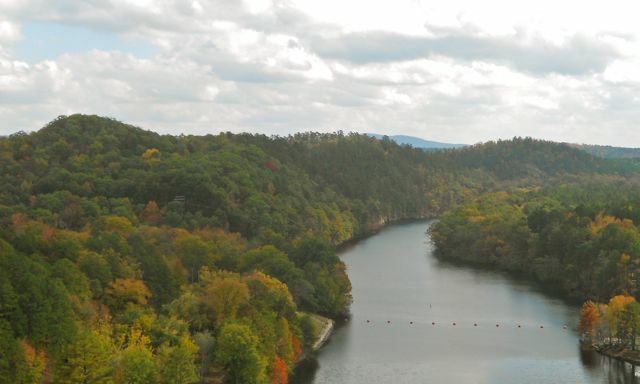 The top of the dam offered a panorama that we are certainly glad we did not miss. With all of this sightseeing, it was important to stay nourished. 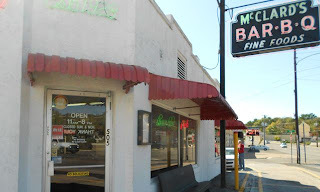 Our primary travel guide, "100 Places in the US and Canada to See Before You Die", listed McClards Bar-B-Q as one such place. 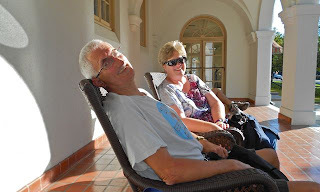 So, one afternoon, we stopped by with Steve and Cathy. I don't take many photos of food. 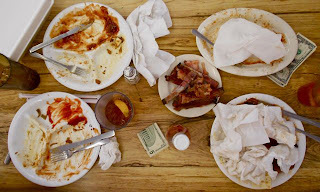 But, I just had to get a shot of our McClards aftermath. As four former Kansas Citians, we take barbeque pretty seriously. This was good stuff. 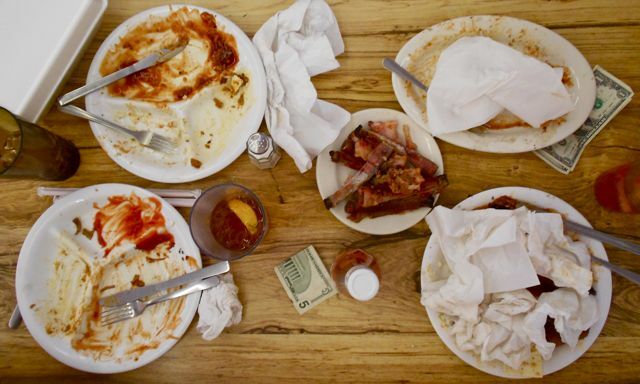 We're always on the lookout for tasty local breakfast spots. 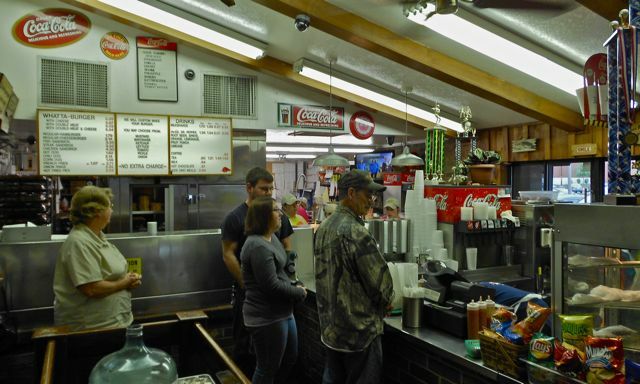 And, we found one in Hot Springs. The English Muffin, located on the shore of Lake Hamilton, is one of our favorites. 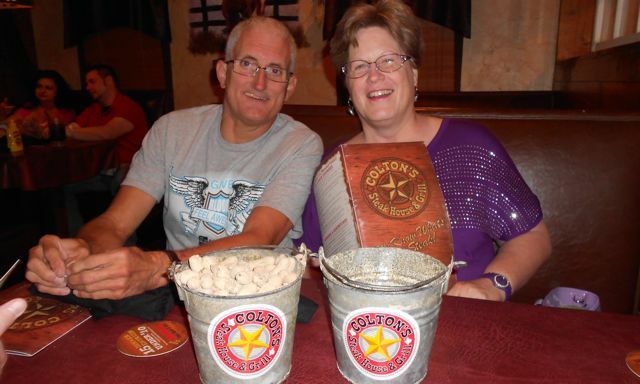 After Cathy and Steve headed north, we were treated to a visit from friends Carrie and Bill. It was great to see them again. We're embarrassed that while they got this photo of us, we didn't get any pictures of them. (Although here's how they looked when we met them in Gunnison a few months ago.) We enjoyed a wonderful dinner in their Tour that featured good food, good wine, great conversation and wonderful company, including Carrie and Bill's kitty Tractor. The most exciting part of our visit with Carrie and Bill was meeting the newest addition to their family, Mizzou, who they adopted on their travels in Missouri this Fall. 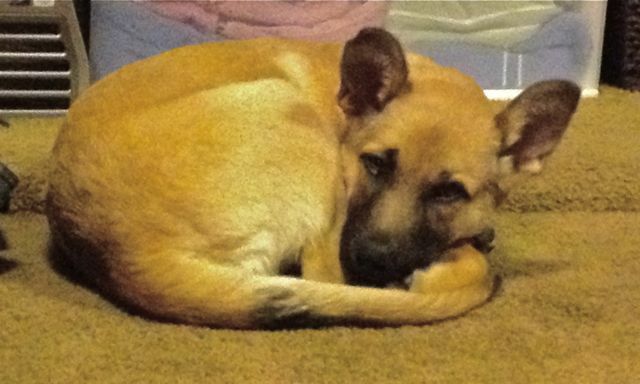 We fell in love with this cute little puppy, of course. 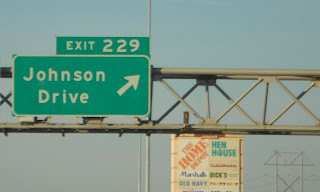 But, as a couple of devoted Jayhawks, we have our own pet name for her. We call her Miss Zou. We said so long to Carrie and Bill and their cute menagerie last night. We were up bright and early to make the long trek to Kansas City. The 435 miles across three states made for a lengthy travel day. It was nearly 4 pm before we reached our destination exit. 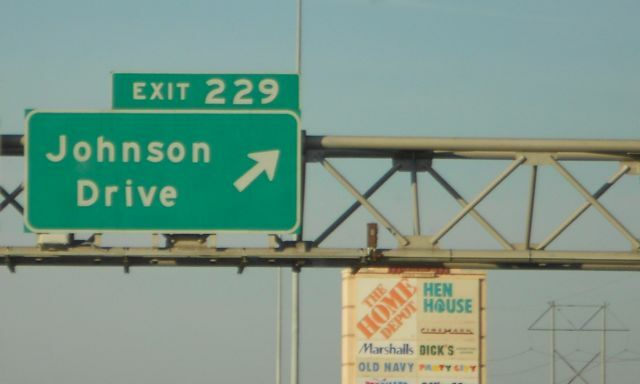 We've never been so glad to see that familiar sign! 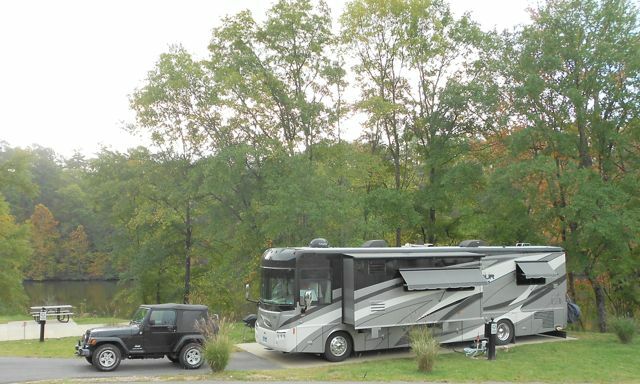 Tonight we're all tucked in at our "home" park, ready to enjoy a month with family and friends in our old hometown. There's something about Arkansas in October that inspires us to sit around a campfire. Our woodsy, spacious, quiet site here at Mt. 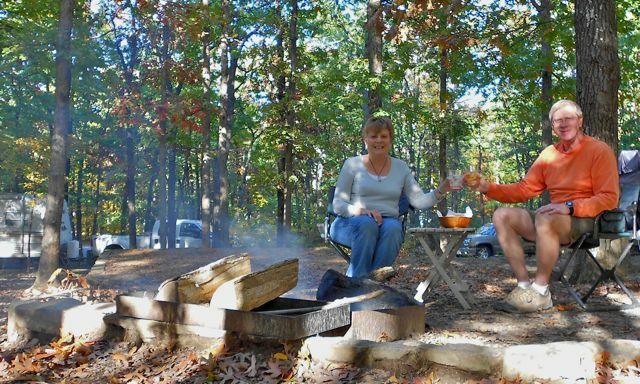 Magazine State Park has been just the place to enjoy some quality time in the great outdoors. 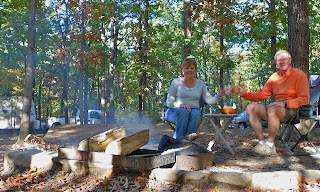 From our fireside seats, we enjoyed this view. Isn't it something? The colors have started to come alive here on the mountain this week. With a dozen trails in the park, we've enjoyed hiking through the changing colors of this mountain forest. The Signal Hill trailhead is just steps from the moose. So, we've made more than one trek to the top of the hill. At its peak, Mount Magazine tops out at an elevation of 2,753, making it the highest point in the state. 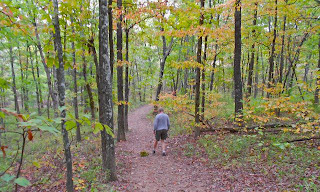 Though we're miles away from a town, a taste of civilization is just a mile away by trail, or a few minutes by Jeep. The Lodge at Mt. Magazine is the crown jewel of the mountain. 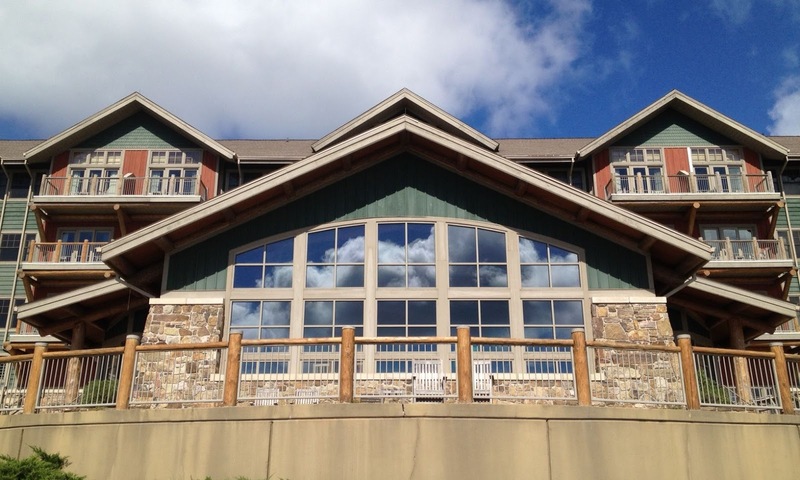 The lodge features 60 guest rooms, an indoor pool and a full-service restaurant, where we enjoyed several tasty meals. 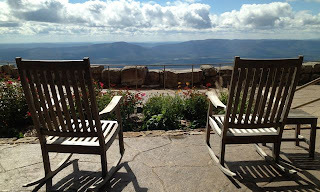 The public spaces in and around the lodge welcome visitors to sit, relax and enjoy the view. With limited cell and data service at our site, the lobby provided a comfortable, sunny spot for us to catch up on our communications. Not a bad "office" at all! 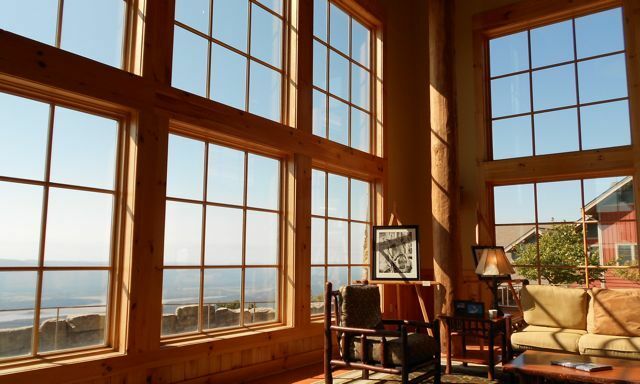 From its dramatic bluff setting, the lodge offers breathtaking views of the Petit Jean River Valley and Blue Mountain Lake. 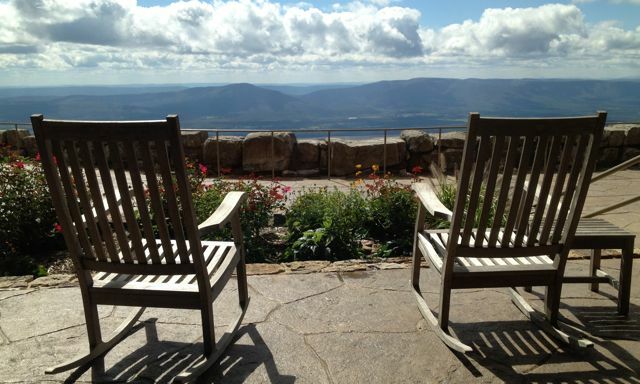 There are 13 guest cabins adjacent to the lodge that also enjoy this sweeping vista. (We were tempted to check in!) 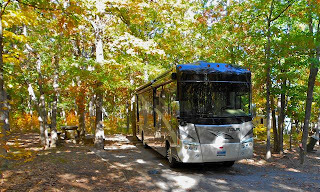 Whether you have an RV or not, Mt. 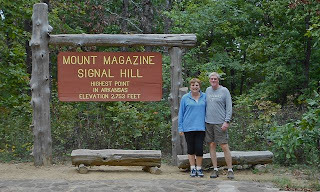 Magazine is a wonderful place to enjoy an Arkansas mountain getaway. 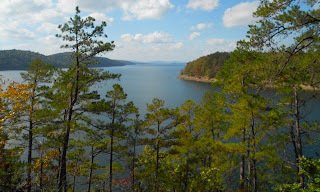 We day tripped to "civilization" in Russellville, which is some 50 miles from the park. Along the way, we spotted a plume along Lake Dardanelle. 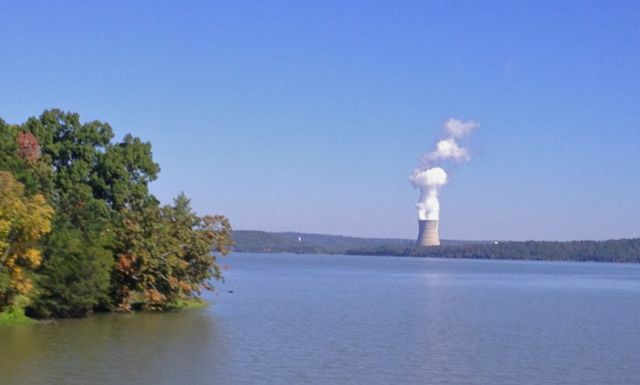 Arkansas Nuclear One is the only nuclear power plant in the state. This isn't something you see every day! 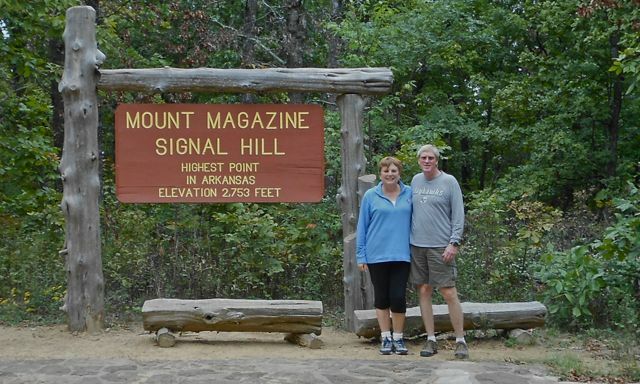 Before reaching Russellville, we stopped by Mt. 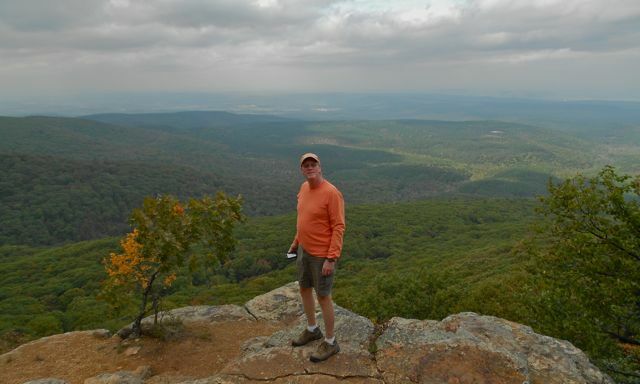 Nebo State Park. 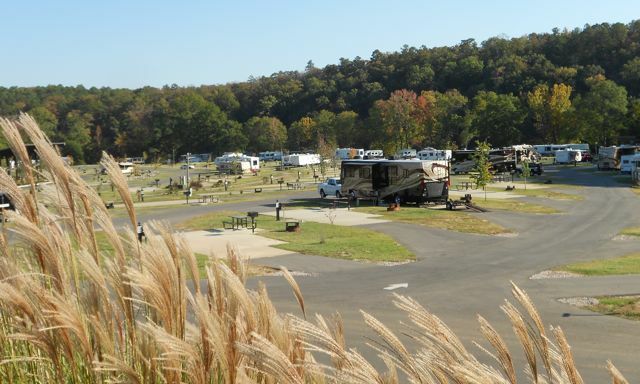 The 34 campsites in this beautiful park are limited to tents and small trailers. 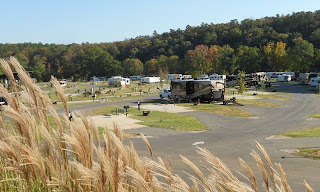 No trailers longer than 24 feet are allowed on the road to the park. 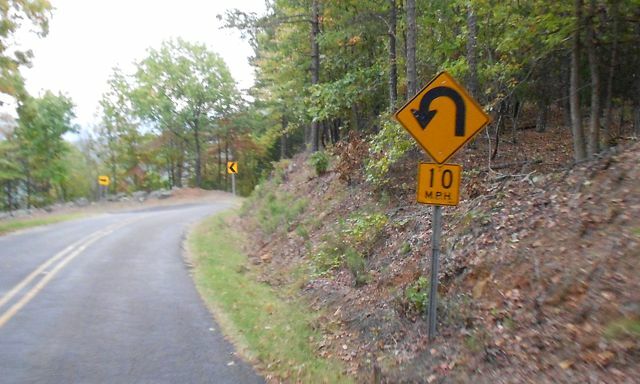 Bullwinkle will never see the many hairpin turns up (and down) the mountain. But, Rocky loved it. Rising 1,350 feet, Mt. Nebo is smaller than its neighbor, but its views are still quite spectacular. 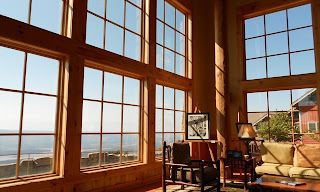 Sunset Point offers a sweeping view to the west, and the Ouachita (pronounced sort of like Wichita) Mountains. When French explorers came to the area in the 1600s, they named the range the Magasins, which is French for "storehouse", which these mountains resemble. Mt. Nebo was originally named Mt. Magazine. But, that name was transferred to the highest point in the range. 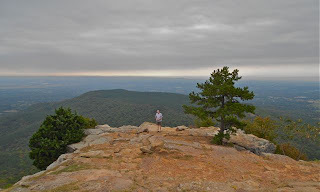 According to local folklore, after the Civil War a resident named the mountain after the biblical Mt. Nebo, from which Moses saw the Promised Land. Back at our spot at this "island in the sky", we've watched the weekenders reluctantly pack up and make their way home. We're enjoying one last night at Mt. Magazine. 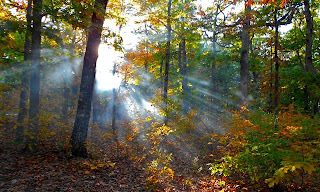 Tomorrow, our Arkansas exploration continues as we head south to Hot Springs.